A woman weeps while she prays for Apiwan Wiriyachai on the first day of his funeral rites at Wat Bang Phai, in Bang Bua Thong, a Bangkok suburb. Apiwan Wiriyachai was a member of the United Front for Democracy Against Dictatorship (Red Shirts), and a Thai politician in the Pheu Thai Party, which was aligned with exiled former Prime Minister Thaksin Shinawatra. He was the Deputy Speaker of the House of Representatives (Thailand's lower house) in the Parliament before the military coup in May 2014 coup deposed the elected government. Apiwan was charged with Lese Majeste after the coup and fled Thailand rather than face prosecution. He died in exile in the Philippines on October 6. 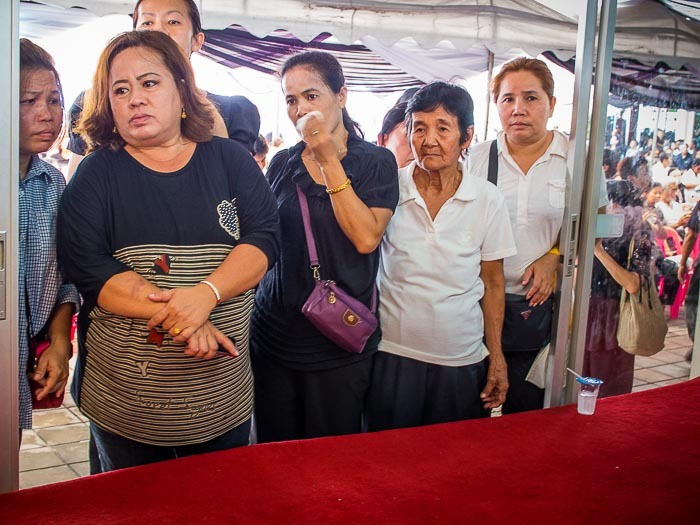 The military government said his body could be brought back to Thailand for cremation but insisted that the funeral should be religious only with no discussion of politics. People come to Apiwan's body to lay flowers on it. The funeral, which is expected to take about a week, started Sunday, Oct. 12. 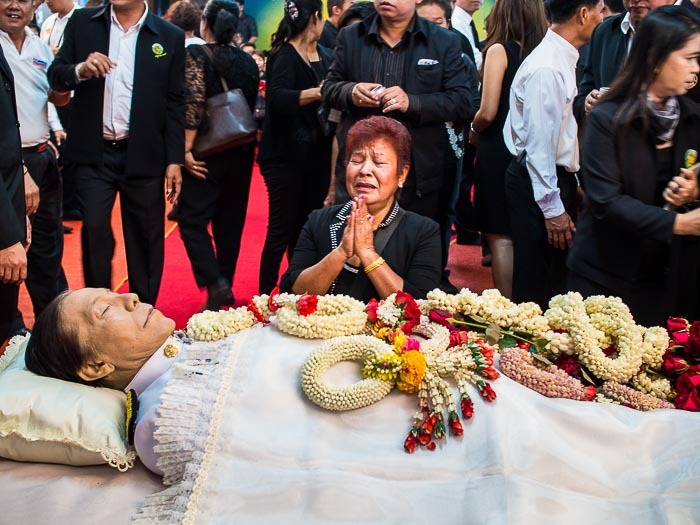 Tens of thousands of Apiwan's supporters and Red Shirts stood in line for hours to pay respects to Apiwan and bathe his hand in scented water. The Red Shirts' political leaders attended the funeral and were greeted as rock stars. They followed the military instructions, they paid their respects to Apiwan, some posed for photos but then left without making public comment. Women stand in an open door and watch the funeral. The funeral was notable because it the first large gathering of Red Shirts since the coup when the army shut down a large Red Shirt gathering and encampment on May 22. 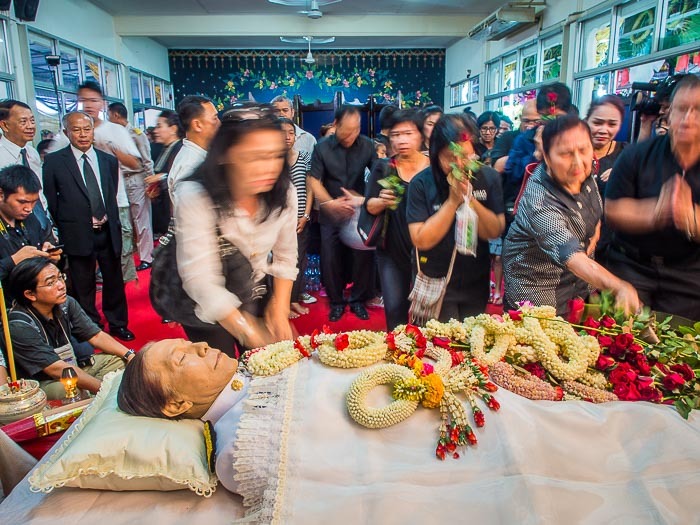 I covered the funeral of the Kamol Duangphasuk, a fiery Red Shirt poet in April. That funeral was filled with political speeches and passion. Apiwan's was not. People paid their respects and prayed but any political talk was done in whispers not shouts. There are more photos of the first day of the funeral rites in my archive or available from ZUMA Press.